How do some people on LinkedIn get hundreds and even thousands of likes and comments on their content, while others are lucky to get a handful of likes and perhaps a comment or two? The best way to go viral is to consistently create incredible content that attracts a large, loyal, relevant, and engaged audience who will comment on your posts. But what if you’ve got great content, but you’re still working on building that LinkedIn audience, and your posts just don’t seem to get traction? One tactic that can give your posts a little boost is to use LinkedIn engagement pods. The concept is simple: Gather a group of people who will like and comment on each others’ LinkedIn posts. 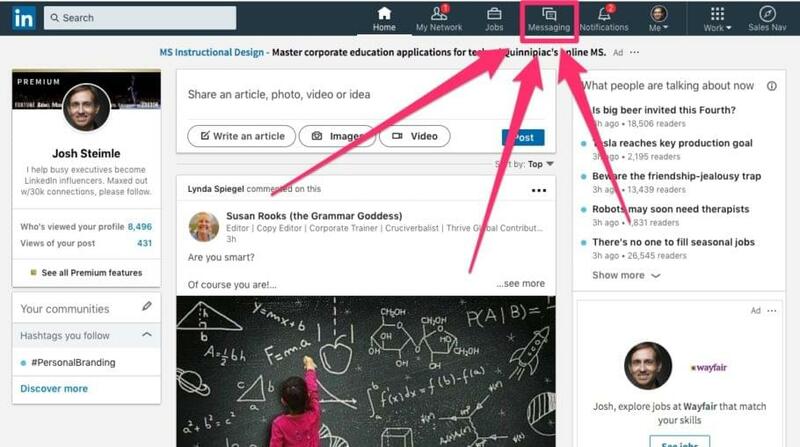 This triggers the LinkedIn algorithm which thinks “Hey, this content is hot stuff, since so many people seem to be interested in it,” and then promotes that content in the LinkedIn feed to others who may be interested in it. If this seems a bit grey hat, or like a tactic that is likely to be abused, you’re right. Engagement pods can be used to game the system (bad), or they can be used to facilitate positive activity that is already happening naturally (good). Think of a LinkedIn engagement pod as a way to “prime the pump.” For those of you who didn’t grow up pumping water by hand (not that I did), old-fashioned water pumps couldn’t pump water from underground unless there was already water in between the water source and the top of the pump. Therefore it was necessary to prime the pump by dumping water into the pump first, in order to get more water out. However, if you stopped pumping, or there wasn’t any water in the well to begin with, priming the pump was a waste of time. Likewise, with LinkedIn engagement pods if the content being shared in a pod isn’t good, you may get those in your engagement pod to like and comment on it, but once you exhaust that source then your post is effectively dead, because nobody else will engage with it. Engagement pods can help good content perform better, but they don’t make bad content popular. If you have any doubts, read this post to see how far the LinkedIn engineering team goes to make sure the feed stays populated with high quality content. One more side benefit of joining an engagement pod–even ignoring the promotion aspect, it can be a great way to give you the motivation and accountability to create content regularly, and an audience who will provide you with helpful feedback. The generally understood rule of engagement pods is that if you’re going to request that people like and comment on your posts then there is some measure of reciprocation. Some pod owners are very strict about this and even keep count to make sure there aren’t any leeches in their pod. I’m not in favor of this, as I explain later in this post. Engagement pods tend to be most effective when there are 20-30 members, and at least 50% of them are very active. More than this, and it becomes too much. If you had a group with 50 members, and every member was posting every single day, then that would put pressure on everyone else in the group to like and comment on 50 posts every day, and that would be too time-consuming. But if 10-15 people in a pod post five days a week, and other pop in here and there, then that tends to work out well. 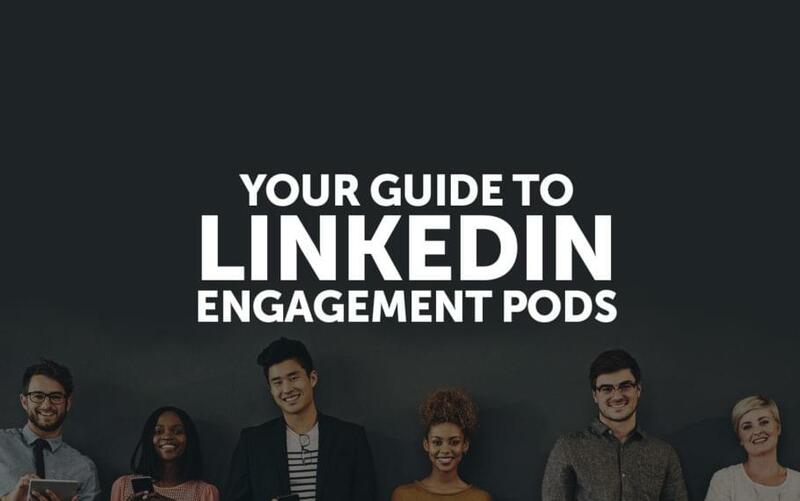 Engagement pods for LinkedIn are typically managed on LinkedIn, although they could be managed on Facebook, Slack, WhatsApp, or any other messaging app. Why would anyone ever manage a LinkedIn pod anywhere but on LinkedIn? LinkedIn messaging has one fatal flaw–you can’t remove people, they have to remove themselves. Therefore if you have a pod member who goes crazy and posts offensive stuff and won’t listen to reason, you either have to convince him to leave the pod on his own, or create a new message thread and invite all your members minus the crazy one to the new message. It’s a pain. LinkedIn, can you please fix that and allow the creator of a message thread to remove recipients? Thank you. The easiest way to get started with engagement pods is to join one already in action. That way, you don’t have to create or manage it, you just participate. The hard part is finding a good one. If you are already sociable on LinkedIn and create great content and do a lot of liking and commenting on others’ posts, chances are sooner or later you’ll be invited to a pod. Then you can try it out, and if it’s a good fit, stay in it. If you want to be a bit more proactive about it, post that you’re looking to join an engagement pod, and see if any of your connections knows of a good one. Now here’s the thing…the quality of an engagement pod is all about who’s in it. Let’s take a step back for a moment and look at how getting attention on LinkedIn works to understand what type of people you want to be in a pod with. I don’t know if Tim has 30,000 connections and 24,308 followers, or 500 connections and 53,708 followers, but I know either way he’s got a large audience on LinkedIn, and that if I’m in an engagement pod with him then his likes and comments on my posts are going to mean a lot. Why? Because every time Tim engages with content, it shows up on his profile, just as you see in the image above on the right-hand side. It will also show up in his feed to a percentage of his followers. Now, of course the numbers aren’t all that matters. In my last blog post I talked about how to get to 30,000 connections, but I was careful to point out that quality matters, a lot. If I go buy 30,000 connections or followers on LinkedIn that’s useless, because I’m not after numbers, I’m after engagement from real people who care about my content and find value in it. But it’s not an either-or proposition, you can have a large audience and an audience that is high quality. 2. Actively engaged. No matter how many followers someone has on LinkedIn, if they don’t like and comment on what’s posted in an engagement pod it doesn’t help anyone. The best way to know if someone is going to be active in a sharing pod is to see what they’re doing right now. If they’re already liking and commenting on a lot of content, that’s a good sign they’ll continue that behavior in an engagement pod. 3. Great content. If you see someone posting great content on LinkedIn, and you say “Man, I love this stuff, she always has such great insights!” then you’ve identified someone who will likely post that kind of content in an engagement pod, and that will help the pod to thrive. If these are some of the qualities you look for in the ideal member of an engagement pod, it’s no surprise these are the qualities others are looking for in you, when considering whether to invite you to their amazing engagement pod. Find out what the rules are. Sometimes they’ve been posted at the top of the engagement pod, but if the pod has been active for some time, that might be a bit more scrolling than you can afford. If you don’t see them, and the group owner hasn’t given you any rules, then ask what they are. Look at past behavior of other pod members. If you’re invited to a pod that doesn’t display a history of past activity, wait a while to see what others do. Be cool. A sure way to get off on the wrong foot is to take a contrarian stance to someone’s content when you don’t know them, or to say something sarcastic that could easily be misinterpreted. Create compelling content that’s easy to respond to. If your content makes other members of your pod say “Um, I don’t even know what he’s trying to say…” or “Man, there’s no way I’m liking this,” or “I get what he’s saying, but I don’t really know what to say back in a comment,” then you’ve got a problem. Your content should be interesting, but also invite comments. For this reason I often start my posts with a non-rhetorical, open-ended question. Have I ever posted those things? Yes, but I’m working my way through a treatment program and promise it will never happen again. But if you’re not content simply being a member of a pod and you want to take the bull by the horns, organize your own LinkedIn engagement pod. Industry. Members of the pod are all within the same industry. It could be self storage, retail, SaaS startups, law, or accounting. Role. Perhaps your pod will only be CEOs, CMOs, entrepreneurs, mommy bloggers, or PR experts. Customer. Your engagement pod members may have nothing in common except that they all target the same customer. Company. At my marketing agency MWI we set up a LinkedIn engagement pod that all team members are invited to. Most aren’t creating content, but whenever someone creates any content that is beneficial to MWI, we try to get everyone to like and comment on it as quickly as possible, or they’re FIRED! Ha, just kidding. Really. Quality. Some engagement pod members are merely a collection of individuals who create great content and are active on LinkedIn but have little else in the way of shared knowledge or experience. Pro tip: This last “quality” point is important. I’ve been in groups that work well, and others that don’t. One thing I’ve noticed about the good groups is that the members don’t have to be pushed to contribute–it’s what they naturally do. They are always creating content, and always liking and commenting on content. They do it anyway. The pod acts to channel their already productive natures. When you’re creating a group, think seriously about every member you’re inviting. If they’re not already creating great content and doing lots of liking and commenting, the pod won’t change that. This is a different type of engagement pod, and the normal rules don’t apply. One difference is that I can have virtually unlimited members because I’m the only one creating a post. Everyone else in the engagement pod is liking and commenting on my post, so it’s not overwhelming to have a lot of members (we immediately had over 25 who wanted in). Note: If you’re wondering why I invited everyone to comment on a single post, rather than each doing their own post with the same hashtag, it’s because I’m experimenting. My theory is that if we use a hashtag, we’ll have 30 people creating their own posts, and individually each one won’t go very far. Even in aggregate, it won’t add up to much. But if everyone comments on a single post, then that post will trigger the LinkedIn algorithm and get a lot of attention, bringing more attention overall to our movement. One challenge I’m already facing, however, is adding people to the message thread. I can only add people I’m connected to, so if I’m not already connected I have to invite them, then remember to add them once they accept my connection request. If this really takes off, I will probably need to move management of this to a LinkedIn group, rather than a message thread. I’ll update this post in the future if needed. Regarding the name of your pod, make it short and easy to identify with your pod, so when members see it in the messages they don’t get confused about what it is. To add people, just start typing their names. I mentioned it above but I’ll say it again–you can only add people you’re connected to on LinkedIn. It also bears mentioning that anyone else in your group can add people to this message, so if you don’t want that, tell them so. Note: I generally change the setting when adding a new member so they can see all past messages, partly because this helps them to see how the group works and how they can fit in, and also because I usually start the group off by posting rules I want everyone to read. 5. Set up some ground rules. Post good content people will actually want to like and comment on. Post daily (or weekly, or whenever you want, or whatever schedule you decide–just make sure to set expectations). Don’t engage in chit-chat in the thread. This last one is important. If you allow casual banter in the thread then every member will be getting a ton of updates and you’ll see them leave quickly. If you want a place where people can chat, set up a separate thread for that purpose. You’re ready, so hop to it. The most common reason a LinkedIn engagement pod will lose steam and die is because everyone gets busy and can’t keep up. This may happen even in groups where the members are top-notch and so is the content, so don’t feel bad if you struggle managing a pod and wonder why it’s not working out like you know it could. The best way I know to make a pod successful is to be a good example and show others what to do. Requiring that everyone like and comment on every single post. This is way too much to ask, and you’re putting people in an awkward situation if they don’t like a post or don’t know what to say in response to it. Requiring a certain contribution level. Saying things like “You must post at least three times a week or you’re out,” or “You must leave at least three comments for every time you post your own content,” has the unintended effect of making the pod too complicated and inhospitable, not to mention inauthentic. Requiring posts at a certain time, or not at certain times. If I’m in a pod and someone says “You can only post between 9 am and 5 pm EST, M-F,” then I’m out. That’s too much to remember, and I don’t want to offend the group owner. It’s easier to just leave. I want to post whenever I create content, I don’t want to have to think “Let’s see, now when can I post this in such and such pod without ticking off the owner?” Note: This isn’t to say you can’t suggest ideal times for everyone to post. That’s just being helpful. Requiring that people like and comment within an hour of anyone posting. Yes, it’s great if people can like and comment within the first hour after new content is posted, but you know what? People are busy, and these engagement pods are way down on their list of priorities. When I set up a pod, I want to make it super easy to participate, so while I might educate them that it’s great if they can like and comment quickly, I’m not going to get on anyone’s case about it. Badgering people to like and comment. Sometimes members of an engagement pod won’t like and comment on a post because they don’t like the post, or they don’t know what to say in a comment, or because the post requires too much thinking to create a comment. But it’s awkward to have to tell that to a pod owner or member who asks “Why didn’t you like or comment on my post?” If nobody is liking and commenting on your posts it’s one of two things; 1) you invited the wrong people to your pod–they’re not natural commenters, or 2) your content is hard to comment on. A potential third issue is that you invited the right people, but they’re coincidentally all busy for an extended period at the same time (unlikely). The solutions are to invite new people who are the right kind, or change your content. If you’re in a pod that’s active five days a week, that’s 200 minutes, or 3 hours 20 minutes per week. And if we’re going to be honest, to leave meaningful comments you’ll probably average more like 3 minutes per post, so that’s more like 5 hours per week. For some, it’s worth it. But if you’re in that boat where you’re thinking “Dang it, I want the benefits of being in an engagement pod, but I don’t have 5 hours per week to invest in it,” then check out my done-for-you LinkedIn service. At my company Influencer Inc we manage profiles for C-suite execs and successful entrepreneurs, and if you become a client then we put you in an engagement pod where we take care of everything, and everyone else in that pod is awesome. Q: This sounds like a terrible idea, so fake, so inauthentic. Why would you do this? A: I totally get it, this sounds like fake engagement, and perhaps that’s what 99% of the engagement pods out there are doing, so I fully understand why people may be jaded. It’s like the late Rex E. Lee said when commenting on the legal profession, “It’s a shame that an entire industry should be maligned on account of four or five hundred thousand bad apples.” There are bad pods and good pods, just like there are bad marketers and good marketers. A bad pod promotes fake activity. A good pod facilitates what already happens naturally. It brings together people who are already great content creators and commenters, and makes it easier for them to do what they are already doing. Q: Are engagement pods good for everyone? A: No. 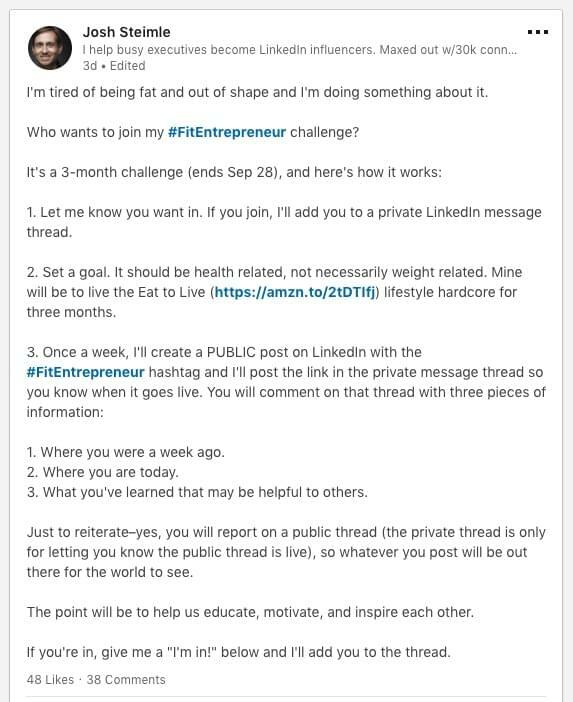 After posting this on LinkedIn I had a debate with a LinkedIn influencer who gets huge engagement on his posts, and he’s never been part of an engagement pod. Because he already has about 50K followers who are highly engaged, joining an engagement pod would make very little impact on his reach. He doesn’t need it, and participating in a pod might be charitable, but otherwise would be a waste of his time.